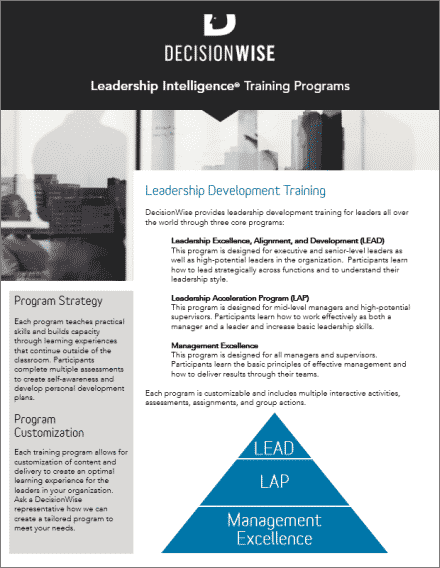 This program is designed for executive and senior-level leaders as well as high-potential leaders in the organization. Participants learn how to lead strategically across functions and to understand their leadership style. This program is designed for mid-level managers and high-potential supervisors. Participants learn how to work effectively as both a manager and a leader and increase basic leadership skills. This program is designed for all managers and supervisors. Participants learn the basic principles of effective management and how to deliver results through their teams. Each program is customizable and includes multiple interactive activities, assessments, assignments, and group actions. Each program teaches practical skills and builds capacity through learning experiences that continue outside of the classroom. Participants complete multiple assessments to create self-awareness and develop personal development plans. Each training program allows for customization of content and delivery to create an optimal learning experience for the leaders in your organization. Ask a DecisionWise representative how we can create a tailored program to meet your needs.